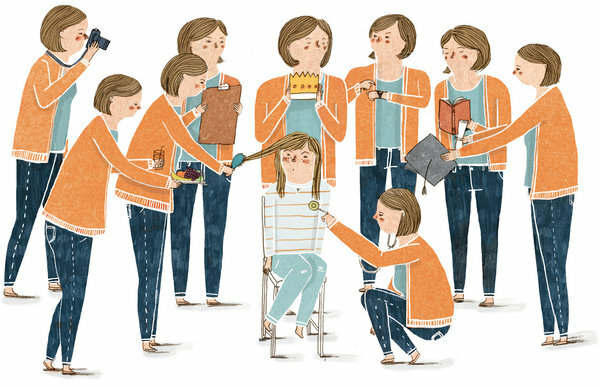 Illustration by Lizzy Stewart for The New York Times. There have been a few articles floating around on the interwebs recently about the potential effect of over-sheltering our children. Often named ‘Helicopter Parenting’ (great visual), it defines a style of parenting that, perhaps unconsciously, shields children from more than just extreme physical or emotional harm, but everyday discomfort or uncertainty. It’s being blamed for the inexplicable rise of depression in young people (aged 18-24) who report absolutely no past traumas or signs of inherent depression, and who describe their childhoods as ‘idyllic’. The rough conclusion is that by not allowing kids to experience problems of any kind, they grow up a little stunted in their ability to cope with and process the far-from-idyllic world of adulthood. I gotta say, it makes sense to me. We’ve become progressively nicer to our kids throughout the generations; once upon a time children were beaten openly for being naughty, seen and not heard, and treated with icy disinterest. Those kids didn’t feel too loved, so they grew up, had kids of their own, downgraded beating to smacking, indulged their kids in a few displays of affection, and were generally nice to them. Catherine Deveny does a cracking presentation about the ‘Benevolent Neglect’ of 70s parenting (read a few choice snippets here) which defines this style of parenting beautifully. Enter the Helicopters of the next generation who went one step further, banning all kinds of physical admonishment and treating their children like demi-Gods. It seems the spawn of these last parental specimens seem to have a few problems in the real world. Namely that nobody else thinks they’re as fabulous as their parents made out they were and they did nothing of merit to earn their fabulousness. Now, this is a big and contentious conversation and though my sarcasm may give me away a little, I’m not in a position to judge how anyone raises their kid (though I do draw the line at beating). So instead of getting preachy, let me tell you a little story of my own. Though the sample size may not be huge or definitive, I think stories have such powerful potential for influence, far more than any study or statistic could ever dream. My story is a little sad, but fear not – all is well now. When my daughter Hazel was 18 months old, I miscarried a baby just shy of my 12 week scan. Miscarriage is a sad but normal part of being a human, and I’m a rational gal; I knew I hadn’t done anything to cause it and understood that a huge number of pregnancies just don’t ‘take’ on basic genetic grounds. All in all, I was sad about a future that no longer existed for my family, but OK with the concept as a whole. My body, on the other hand, didn’t really know what to do with itself. I could feel the imbalance of hormones and chemicals in my blood as palpably and painfully as a flu vaccine pumping through my veins on repeat. And trying to take care of an 18 month old, a business on the verge of success, and a broken mind/body wreaked havoc on my life. I just thought I was sad about losing a baby. Seemed logical. But it soon became clear that it was more than that. One minute I would be doing dishes, the next I would find myself folding like an accordion on the kitchen floor, sobbing without warning. Walking zombie-like through my days, frightened to answer my phone lest someone said something that set me off. On one accordion-sobbing occasion, Hazel toddled in to find me in my predicament. Her immediate reaction was fright, and my immediate reaction was fight: get up, wipe away the tears, talk normally, convince her nothing had happened. She can’t possibly understand, and it’s a far too grown-up issue to go into with a kid so young. The first few times I managed, but after a while, my body just wouldn’t get up off the floor and the tears just wouldn’t stop. I couldn’t form a basic sentence to protect her from the horror of the scene and she looked on, often in tears herself and obviously frightened. Help was sought, enter my unstoppable husband and family who scraped me up off the floor (figuratively) and the long healing process began. I say long because it was – 12 months at least. But a funny thing happened. During this period, Hazel not only began to soften to my sadness, but became hyper-aware of it. She would curiously follow me into a room as I tried to hide, instinctively knowing I wasn’t doing too well. Often predicting it before it even happened, she would sit up urgently and ask me (as she had heard so many ask me) “What’s wrong, mummy?” If she saw me crying, she would climb right up into my space, rub my back and softly say (as she had heard to many say) “it’s OK.” Even her little face took on an almost comical, wrinkled-brow look. You have no idea the healing power of seeing a human so tiny exhibit behaviour so empathetic. It restores one’s faith in humanity. All is truly well now. Another baby will join the family in the coming weeks. Hazel is a happy little Vegemite. Indeed, so am I. But now Hazel’s instinctive response to seeing someone cry, child or adult, is to kneel with them, rub their back, assume a face of reverence and say softly that it’s OK. At 3 years old she knows that sometimes, that’s all you can do for someone when they cry. There are people of 30 who still haven’t learned that. People who live their entire lives never learning that. My instinct was to protect my child from the fright of seeing her mother vulnerable, but in the end it was allowing her into that vulnerability that created the strength and awareness that I doubt will ever leave her. We view children as precious and defenceless, but also selfish and unable to see outside themselves and their needs. In some ways that’s true, but strength, compassion and empathy are learned behaviours. How soon they are learned depends only on how soon the lessons start. You can engineer good experiences for your children. You can orchestrate an idyllic childhood. The same can’t be said for bad experiences. All you can do is grab them with both hands when they arise and drag your kids along for the bumpy ride. If there is one thing I can say for certain, it is that you will experience pain, death, loss and misfortune at some stage during the 18 years that your child is in your care. For me, it’s comforting to know that I can make those experiences count for something, and that they will galvanise my kids for the uncertain wonder of life ahead. And hopefully make them all the more able to understand and appreciate it. This entry was posted in Parenting and tagged Empathy, Helicopter Parenting, Motherhood, Parenthood. Bookmark the permalink. Woweeee! You never cease to amaze Amy! So incredibly talented and a superb human being to boot! And it seems that little Hazel has not fallen far from the tree! I wish I had even a teeny tiny drop of your skill as a writer so I could articulate how incredible today’s DoE instalment is. Thank you so much for sharing your story – a giant handful of tissues were definitely required. I am sorry to hear about the incredibly tough time you had, I can not even imagine how devastating having a miscarriage would be. I felt overwhelmed by your courage in sharing your story and was particularly moved by your portrayal of the ensuing grief. It resonated with me as although I have not experienced the loss of miscarriage, we are not having any luck starting a family and I find myself grieving a future that I always thought was a given. Like you, I am rational and know that it can take a loooooooooong time sometimes, but unfortunately it doesn’t always ease the sadness. So thank you, thank you, thank you! You are incredible and an inspiration! P.S. I don’t want to liken the divine Hazel to a cat, but your description of Hazel’s initial response reminded me of my poor scaredy cat – I think she found my sobbing rather terrifying!! You know when cats are scared and they do the really slow close to the ground walk – poor Kitty! Unfortunately, I don’t think Kitty will ever learn to rub my back and say it is ok, but she is pretty good at cuddles. Thanks again Amy!! Sorry, did not mean to post that comment twice! I got a bit confused as apparently I have a WordPress account (who knew!?) and it said it wouldn’t post my comment until I logged in – I call liar! As it did post it, and then again when I logged in! Sorry! Crack up! A comment so nice, you posted it twice! Thank you so much, Em. It’s so nice to hear that a difference can be made by talking about the heavy stuff in a positive but non-controversial way. I feel like everything I read in the media these days is designed to start a fight. Also, you can also compare Hazel to a cat ANY DAY OF THE WEEK. Thank you for your beautifully written blog. Having worked in the IVF area for 10 years it truly was an insightful read from the other side and I am sorry that you had to experience the great loss of losing a pregnancy., I can only begin how difficult this must have been. Your discussion around parenting was insightful and was a discussion around work colleagues today. It was interesting to discuss the parenting styles of our parents compaired to some styles of today. One that comes to mind was a family that informed a colleague who was babysitting that they let their 2 year old make her own decisions in everything and that they never said no. How do children learn the concept of boundaries and that failure it a part of life and learning? Where do that learn that the disappointment of failure is the fire that drives success? Congrats on your current pregnancy and I hope all goes will with the safe arrival of your little one. It looks that Hazel is well equipt to be a wonderful older sister who is wise beyond her years .